“AJR is happy to host the Early Jewish Christian Relations SBL section’s 25 Year Retrospective. This panel met in San Diego at the 2014 annual SBL meeting and included Andrew Jacobs, Jeffrey Siker, Adele Reinhartz, Ra’anan Boustan, Ross Kraemer, and Susanna Drake. This second response is from Jeffrey Siker, who organized the initial Early Jewish/Christian Relations consultation. Previous posts include Andrew Jacobs' introduction." Twenty-five years ago I was a fresh eager newly minted Ph.D. who had recently completed a dissertation on an aspect of Jewish/Christian relations in the first two centuries CE. As the son of a Jewish father and a Roman Catholic mother, with an uncle who was an orthodox rabbi and a great aunt who was a mother superior, it only made sense somehow that then as a Presbyterian minister I began my teaching career at Loyola Marymount University, a Catholic Jesuit institution, where I still teach about early Judaism and Christian origins, among other things. When I surveyed the landscape of the SBL annual meeting at that time it became apparent that there were not many venues, in terms of program units, in which to pursue the intersections of early Judaism and early Christianity. In 1988 there was only one program unit with some focus on both early Judaism and early Christianity. This was the “Jewish and Early Christian Liturgy Group,” which had been organized by Larry Frizzell and Asher Finkel, both at Seton Hall, a few years before. In 1986, when I started regularly attending the SBL meetings, theirs was the only one among 62 different program units, one session among 90, that consciously and explicitly looked at intersections of early Judaism and Christianity, in this case with a liturgical focus. And so, inspired by teachers and scholars such as John Gager and Alan Segal, among others, I proposed and organized an initial consultation on “Early Jewish/Christian Relations,” which held its first sessions in 1989. The consultation on ‘Early Jewish/Christian Relations’ will explore aspects of the relationship between formative Christianity and early Judaism during the first two centuries CE. It will focus particularly on early Jewish/Christian interaction, exploring dynamics in the separation of emerging Christianity from early Judaism. It will also analyze the character of Jewish/Christian interaction during the consolidation of each as a separate religious tradition, especially in the second century. The original proposal also suggested several areas for topics to be addressed, including methodological issues, regionalism, the place of proselytes, the impact of imperial Rome, comparing Palestinian with Diaspora Jewish/Christian relations, the heritage of Paul in the development of Jewish/Christian interaction, the social setting of adversus Ioudaios literature, and so on. The initial steering committee included John Koenig, Alan Segal, Gerry Sloyan, Stephen Wilson, Jarl Fossum , and Terrance Callan, not the most diverse representation of scholars, especially in hindsight, but all solid citizens in the exploration of early Jewish/Christian relations. After the first couple of years and a successful program review the program unit was renewed as a Group, and at the same time it expanded its scope to the first four centuries CE. When the program unit was renewed as a group the steering committee grew and became more inclusive of women and more balanced in terms of the number of scholars from both Jewish and Christian traditions. Claudia Setzer (Manhattan College) came on as co-chair, and eventually Pam Eisenbaum (Iliff School of Theology) did the same, as I eventually cycled off the leadership of the group, which by then had been renewed again as a section. In terms of scholarly trends, the Jewishness of Jesus and the Jewish contexts of Christian origins had become an important focus in the mid-1980’s. The 3-volume McMaster Symposium on Jewish and Christian Self-Definition appeared from 1980-82. This was followed shortly by the Canadian Society of Biblical Studies two volumes on Anti-Judaism in Early Christianity (1986). (The leadership of Canadian biblical scholars should be noted here.) Ed Sanders’ Jesus and Judaism had appeared in 1985; James Dunn’s Parting of the Ways symposia was under way in the late 80’s; and John Meier’s first volume of A Marginal Jew was published in 1991. There was clearly growing interest in both the intersections and separations of Christianity and Judaism. And so by the year 2000 the number of SBL program units addressing aspects of both early Judaism and early Christianity had increased by five sections/groups. These additional groups were: 1) Scripture in Early Judaism and Christianity (which also began in 1989), 2) the Social History of Formative Judaism and Christianity, 3) the Ancient Fiction and Early Christian and Jewish Narrative Group, 4) the Early Jewish and Christian Mysticism Group, and 5) the Wisdom and Apocalypticism in Early Judaism and Early Christianity Group. The annual meeting had also grown from 62 to 95 program units, with 167 different sessions. I found particularly interesting a change in one program unit from 1989-1990: “The Social History of Early Christianity Group” changed its name in 1990 to the “Social History of Formative Christianity and Judaism Section.” Though the content of the papers in 1990 didn't really reflect the change in name, nonetheless this reflected an important conceptual shift that had taken place in the guild. Put simply, the study of Christian origins was understood more overtly as solidly within in the religious and social worlds of early Judaism, or Judaisms. The rise of early Christianity and the rise of early Judaism were increasingly seen as more and more enmeshed and an inseparably tandem development. As Daniel Boyarin put it in his 1999 volume, Dying for God, “Like many twins, Judaism and Christianity never quite formed entirely separate identities” (p. 5), a sentiment already found in Alan Segal's 1986 book, Rebecca's Children. This increased perception of the blurring of boundaries between different forms of Judaism and Christianity, of Christian Jews, Jewish Christians, Pharisaic Christians, Gentile Jews, among other concatenations, resulted in pushing the stages of separation further and further into the future. Tony Saldarini’s 1994 volume on Matthew’s Christian-Jewish Community stressed the intramural character of polemical rhetoric between those Jews who believed in Jesus as the messiah and those who did not. There was certainly fighting and tension, but no split as of yet. On other grounds Steve Wilson’s Related Strangers (1995) dated the real separation not to the Jewish War of 66-70, but to after the Bar Kochba Revolt of 132-135 CE. 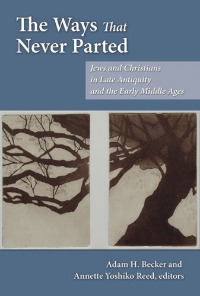 And more recently the 2007 volume, The Ways That Never Parted, edited by Adam Becker and Annette Yoshiko Reed, continues this movement of seeing ongoing significant interaction between Jews and Christians, so-called, well into the sixth century and beyond. (- including articles by my co-panelists Andrew Jacobs and Ra’anan Boustan). The continued debate over the parting of the ways finds reflection in the still growing number of SBL sections devoted to Jewish and Christian intersections in the early centuries. Since 2000 five more program units have been added to the existing slate of groups dealing with some aspect of Jewish/Christian relations: 1) the “Function of Apocryphal and Pseudepigraphal Writings in Early Judaism and Early Christianity Section,” 2) “Jewish Christianity/Christian Judaism,” 3) “Jewish-Christian Dialogue and Sacred Texts,” 4) the “Paul and Judaism” consultation, and 5) “Violence and Representations of Violence among Jews and Christians” (again with a nod to Ra’anan). It is no accident that at the meeting this year joint sessions are being held between the Jewish/Christian Relations section and the “Paul and Judaism” consultation and with the “Social History of Formative Judaism and Christianity” section. Today, then, there are eleven program units that explicitly address Jewish/Christian relations in some manner, with varying degrees of overlap. Thus in the 25 years since 1989 we have moved from 1/62 program units devoted to Jewish/Christian relations to the present situation of 11/174 program units addressing such interaction, an fivefold increase over the situation in 1989 when the Early Jewish/Christian Relations Consultation began. So the trend continues. But why? In my view three factors help to explain this ongoing and deepening interest in early Jewish/Christian relations. First, it seems safe to say that the evidence from the first several centuries both allows and even calls for fundamental changes in our perceptions of early Jewish/Christian relationships. In particular, we are more attuned to the dangers of reading later theological and social developments in Judaism and Christianity anachronistically back into the first century. And so for a good generation or two already we have ceased talking about “late Judaism” or “normative Judaism” that gave way to the birth of an adult Christianity. Instead, we recognize the dynamic character of what we now call early and formative Judaisms, including the Christian movement. This includes a key understanding that recognizes formative Jewish and Christian movements as sibling rivals rather than as parent/child (already noted in Alan Segal’s Rebecca’s Children). A second factor involves our own changing situations as scholars and people of faith at the end of the 20th and beginning of the 21st centuries. Modern Jewish/ Christian relations, especially in light of the Holocaust, have compelled scholars of antiquity to find more kinship between Jews and Christians, so that the formative periods of both religious traditions might provide positive resources for Jews and Christians today to approach each other as potential sisters or brothers in faith, even if in different covenant relationships. Thus the harsh critique against the Jews in the Gospel of John have been revisioned as attacks on a specific group of Jewish leaders and not on Jews in general; likewise the curses against the scribes and Pharisees from Matthew 23 are contextualized in light of prophetic invective and so de-fanged. We grab onto Paul's statement in Romans 9-11 as providing a basis for a dual covenant approach to faith rather than a supercessionist approach. In my view this has sometimes led to tendentious and just plain wrong readings of both early Jewish and Christian texts, as we wish for a more tolerant expression of early Christian faith. But the point is that we are finding evidence in the primary sources that lead us to more complicated and often positive evaluations of Jewish/Christian relations even in the midst of no little hostility (from Melito of Sardis to Chrysostom and beyond). Central to this changing situation in our own contexts are the profound developments that resulted in Nostra Aetate from Vatican II in 1965 and its aftermath, which has contributed directly to scholarly reassessments of historic relations between Christians and Jews. One consequence has been the formation of over 40 Centers on Jewish-Christian Relations in college and university settings, ranging across such institutions as Boston College, Cambridge University, the Gregorian University in Rome, and Hebrew University. Many scholars are involved regularly in the meetings of the International Council of Christian and Jews. Similarly the Hartman Institute of Jerusalem has partnered with the American Jewish Committee to sponsor a Christian Leadership Initiative for North American scholars and church leaders to think in fresh ways about how and what Christians teach about Jews and Judaism. Paulist Press launched its ambitious Stimulus series on Jewish/Christian relations, now at over 20 volumes, that sought to promote dialogue. All of these developments have resulted in inter-religious friendships, sometimes nervous friendships (especially in relation to Israel), but friendships nonetheless. Such modern friendships bring to mind significant reflections on difficult friendships with ancient authors and texts, such as Adele Reinhartz’s Befriending the Beloved Disciple or the Jewish Annotated New Testament edited by AJ Levine and Marc Brettler. Third, the growing number of Jews trained in the study of early Christianity is noteworthy, as is the observation that many of these scholars teach in Christian schools and seminaries: AJ Levine at Vanderbilt, Pam Eisenbaum at Iliff School of Theology, Sarah Tanzer at McCormick Theological Seminary, Paula Fredriksen formerly at Boston University, Claudia Setzer at Manhattan College, and Larry Wills at Episcopal Divinity School, to name but a few. In all of these ways and more the engagement of scholars today on the historical, social, and religious relationships of some rather messy developments in the formation of Judaism and Christianity in antiquity has resulted in deeper understanding of the emergence of the Jewish and Christian movements, as well as in deeper understanding of relations between Jews and Christians today. And that can only be good. Jeffrey Siker is Professor and Chair of the Department of Theological Studies at Loyola Marymount University in Los Angeles, California.